Individual Mentorcoaching - SeattleCoach! "Connection. Curiosity. Challenge." At each level the requirements grow: Your hours with clients and coachees, your hours of coach-specific training and for your first few years, your hours of Mentor Coaching. Mentor Coaching is a dynamic personal learning experience as you develop your understanding and use of the ICF Core Competencies. And it's a requirement for the level of credentialing you're initially aiming for: The ACC. In Mentor Coaching, we "connect the dots" between your skill development, your coaching presence and style, and the eleven ICF Core Competencies. We'll give you feedback to reflect on and to put into practice going forward. Before you can apply for the ACC, you need to complete ten hours with a qualified Mentor Coach over at least a three-month period. Seven of those ten hours may be done in a group setting with ten or fewer members. Because of this, SeattleCoach schedules seven hours of group Mentor Coaching in Module II--after Cohorts have worked hard together to grasp the Core Competencies. If you are a SeattleCoach and were present for all of Module II, you got those seven hours (check your Module II certificate—if you had to miss any of those Module II sessions, you will need additional hours). If you were present for all of Module II, you’ll only need three more individual hours before applying for your credential. 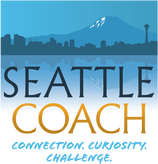 Since the ICF requirement is to do your ten hours over a minimum of three months, most SeattleCoaches schedule individual hours of Mentor Coaching following the end of Module II. We want you to schedule them in a way that maximizes your learning as you accumulate your first 100 hours of coaching (with at least 8 people/75 of these hours have to be "paid" hours). There is a separate place on your ACC-ACSTH application to document these hours and dates, so along with the rest of your documentation for this application, keep track. Your future self will thank you. (Click on the option that says "ACC-ACSTH Path"). We have designed Module III for SeattleCoaches who are continuing to develop professionally--and with the ICF credentialing and renewal requirements in mind. In addition, a Mentor Coach needs to have earned and then held his or her ICF Credential for at least one renewal cycle (that's three years). Click here to read Patty's best shot at demystifying the ICF renewal requirements. How is your own style evolving? Patty offers mentor coaching and supervision at a discount to members of the SeattleCoach community. When you're ready to schedule individual mentor coaching sessions with Patty, please click on one of the options below (or just bring a check). If, after three meetings, we continue to work together on the development of your work, we can easily create a new charge. please pay them directly, not through these links.